Old age limits the body’s physical and mental abilities. They are no longer in their golden times. They are now slower, weaker, and more sensitive. Since it is the case, senior citizens should be provided with means to remain in the pink of health. Losing the excess weight benefits seniors magnanimously. A leaner and stronger body has a better sense of balance than malnourished ones. This would help them evade home accidents like slipping and falling. Besides, being in a better shape boosts one’s self-confidence. Senior citizens may realize that they should still value their bodies. Age is just a number, not the end of the line. Walking is a world-known cardiovascular exercise. Simply put, it can help one’s heart get stronger. Due to constant exposure, the heart becomes more immune to fatigue. A consequence of which is an improved blood pressure. Leg power and endurance are enriched while walking. Like oil to an old machine, exercise is a lubricant that keeps the body gears functioning properly. If senior citizens acquire stronger lower limbs, the issue of mobility may be eliminated. It’ll grant them a sense of independence as they can go to places and do things independently. Walking promotes a better posture. 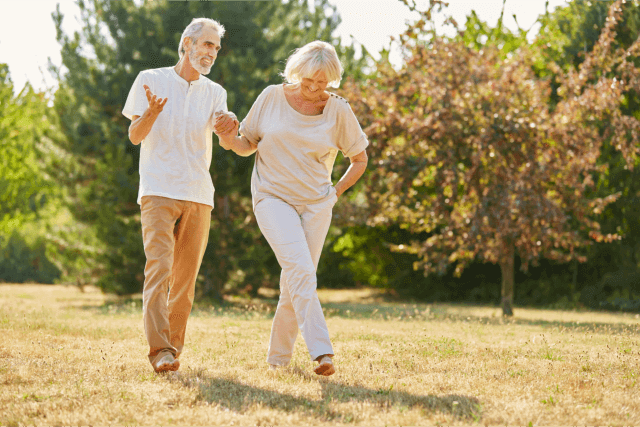 If done properly, walking will cause the body’s muscles and bones to stay at their rightful places. If not used regularly, the same may crumble and fall into deterioration. Walking for at least 30 minutes a day is enough to fully activate your body cells. It is one of the simplest methods to naturally revitalize. Why? Since the blood is pumping healthily, more oxygen and nutrients are distributed throughout the body, making one alert and invigorated. Reduced risk of common health complications. Old age heightens health risks. Common examples are diabetes, hypertension, and other heart-related diseases. However, the probability of acquiring them may be managed with daily walking. Walking helps in building a stronger immune system. Walking triggers the release of the feel-good hormones named endorphin. This simple exercise is highly recommended for senior citizens with mild to moderate depression. Cannot find enough time to be with your senior loved one? Not a problem. We have a favorable solution for you! Being known for its quality Home Health Care Services in Ohio, Buckeye Home Health Care is the perfect partner for senior citizens with delicate needs. Our caregivers, skilled nurses, and other medical professionals are equipped with the sufficient knowledge and experience to deliver assistance and provide companionship. Our services are mainly centered in skilled nursing, IV care, physical therapy, occupational therapy, wound care, and home health care. For your questions and concerns, simply call 614-776-3372. This entry was posted in Health, Tips and tagged Exercise, Mental Health, Physical Health, Walking. Bookmark the permalink.